The bathroom isn't often thought about when deciding on lodge furniture. The living, dining, bedroom and kitchen tend to take priority, but when you're in the bathroom...you're a captive audience. 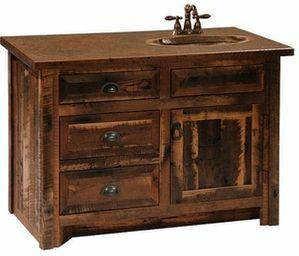 Many of our furniture lines include bathroom vanities. These pieces help to complete the overall look and have an important functional component as well. Browse our site to see if you can find the perfect complementary piece for your master or guest bath. Tops are usually left solid to be custom fitted for your sink and components. Stop by our Eureka showroom to see an example of a custom rustic barnwood style that can be modified to your needs.